Field guides are a gateway to understanding the natural world. Indeed, many herpers I know treasure their very first field guide, which opened their eyes to the diversity around them, keeping its tattered remains up on a shelf next to newer editions as a memento. My first was copy Peterson’s “Reptiles and Amphibians of Eastern North America” published in 1991. That book still resides with me today, with “KILEY” crudely drawn in sharpie across the spine. A good field guide is critical to helping people figure out how to identify the species found in their area, yet many people do not know how to properly use one. Case in point, when someone reports an Eastern Ribbonsnake to the Vermont Herp Atlas without including a photo, they are asked they knew it was a ribbon and not a gartersnake, which is much more common and looks quite similar. If the person says “it looked like the picture in the book”, they will be pressed for more information. What field marks did you see that helped you rule out a gartersnake? If you cannot provide those details, I’m afraid your sighting won’t count for much. This problem is made worse by the fact that there is a lot of variation in color and pattern in some species and field guides can only include one or two photos or illustrations representing what the species usually looks like. For example, in the Peterson guide, there is one photo and one illustration of a Green Frog, but in the below image you can see that with only two examples it is very difficult to fully represent the full diversity of Green Frog colors and patterns. Unknown frog from Central Vermont that we will identify using the Peterson field guide. Step 1. Find the pages with ‘plates’, or images of all the different species and look for some that look somewhat similar. Maybe you already know what family or genus the frog is in and can start on the correct page, but maybe not. For this particular frog there are a handful on this page that look similar. Those are the Mink, Carpenter, Bronze, Green, River, Pig, and Bullfrogs. At this point you’re just coming up with a list of frogs that look kind of similar. Color plates of frogs in the Lithobates genus from a 1998 copy of the Peterson guide. Step 2. Go to the pages with more detail for each of the possible species and look at range maps. While it is certainly possible you found a frog outside of its known range, it is unlikely. The range maps are updated based on new information, so don’t fuss over whether or not you are exactly within the shaded part of the map or not, but if you are over 100 miles from a species range you should probably be ruling that species out right now. For example, Florida Banded Watersnakes and Alligator Snapping Turtles are probably not swimming around in Vermont rivers. The frog in question was found in Vermont, so we can use the range maps to narrow the list down to just Mink, Green, and Bullfrogs. Because Pig Frogs do not occur anywhere close to Vermont, we can use the specie’s range to eliminate it from consideration. From the 1998 Peterson field guide. Green Frogs have dorsolateral ridges (dorsolateral ridges are folds/lines of skin running down each side of the frog’s back and are as useful for identifying species as knowing if a tree has opposite or alternate branches). Bullfrogs do not have dorsolateral ridges. Mink Frogs sometimes have dorsolateral ridges. Image showing Green Frog (rear) and Bullfrog (front). Notice the line/ridge running down the back of the Green Frog, but not the Bullfrog. The frog in question does not have dorsolateral ridges, so we can take the Green Frog off the list. Furthermore, the frog in the picture has dark bands across the hind legs. The book explains that Mink Frogs can have round or irregularly-shaped spots on the legs that run along their legs, not across them. This is strong evidence that we are not looking at a Mink Frog, but rather a Bullfrog. Lastly, this frog was about 4-inches in length, which is significantly larger than a Mink Frog, but within the expected size range of a Bullfrog. When I was young and being coached by the VT Herp Atlas director, Jim Andrews on how to write a good description so my sightings could be added to the species maps, he told me a simple rule that I still stand by today. Use three field marks that combined can rule out any similar species in the area. Thankfully, good field guides will list more than three. In the case of the Bullfrog, we used the lack of dorsolateral ridges, the crossbanding pattern on the hind legs, and the frog’s size to rule out all similar species found in the area. There are certain things I look for right away when trying to identify an unknown herp. For snakes, are the scales keeled (rough) or smooth? In frogs, the presence or absence of dorsolateral ridges is a great start. In turtles I look at whether the posterior edge of the shell is serrated (jagged) or smooth and whether the bottom of the shell is hinged or not. 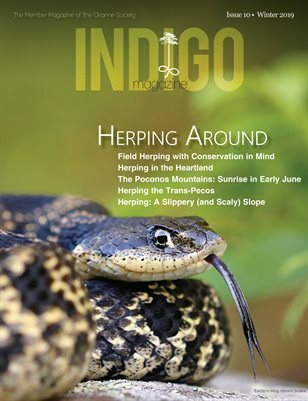 An experienced herper might not need to think about these things and will already know which species they need to choose between, jumping immediately to the more subtle field marks, such as whether or not there are markings on the labial (lip) scales or how many scales are behind the ear of a lizard. Apps such as iNaturalist and WhatTheHerp.com can help automatically suggest a species ID, but it will be up to you to decide whether or not the suggested ID is correct. I only recently started using iNaturalist and found myself using it to try to identify different mushrooms. What I learned very quickly is that lots of different mushrooms look too similar to one another for the app to get it right all the time and I had to find a good field guide to learn what the actual field marks are. The app just uses overall appearance to make an educated guess and is often wrong. An ID attempt by iNaturalist that did not even identify the correct family. iNaturalist failed miserably at the salamander pictured above. It is leucsitic, meaning it has no pigment in the skin. I was able to identify it using three field marks and by knowing what species occurred in the area. The short rounded snout, the thick body, the fairly round tail, the swollen cloaca, and short toes all in combination helped me figure out it is a pure-bred Blue-spotted Salamander (Not even in the Plethodon family, as iNaturalist suggested). Regional field guides, such as Peterson’s, are great if you travel a lot and want just one guide that will work in lots of places, but nothing beats a good local guide. Generally speaking, the larger area a book covers, the less detail it has for each species. For Vermont, I like the “The Amphibians and Reptiles of New York State”. Rather than covering hundreds of species, it just covers only 70 and provides thorough descriptions with multiple photos of each species. By providing multiple photos it also allows readers to more fully appreciate the amount of variation within each species so you aren’t stuck trying to match the frog you found to an image of what the species is supposed to look like most of the time. To sum things up: look at the pictures, use range maps to narrow the list of options, then use field marks to rule out all but one species. You’ll do pretty well most of the time this way. Thankfully, most of the time the process is very straight forward, but sometimes even I need a little extra help and ask a local expert to weigh in. Enjoy!